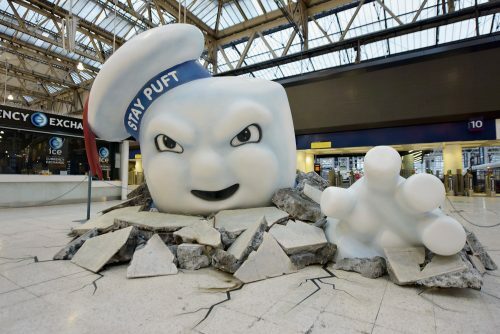 From the home of the London Necropolis Railway, Waterloo Station, has been attacked by the Stay Puff Marshmallow Man. A great inspiration to a film that everyone was worried about until the critics saw it. They loved it! This is the sort of thing I love. Major pieces advertising a film. Not only does it bring a smile to commuter’s faces it shows you how much work can go into the publicity of a film. Not only do we have Stay Puff himself but a whole load of Ghostbusters helping the commuters survive their trip to work without being slimed on the way.